(Nanowerk News) A long-standing challenge in modern materials design is to create low-density materials that are robust against defects and can withstand extreme thermomechanical environments because these properties typically are mutually exclusive: the lower the density, the weaker and more fragile the material. 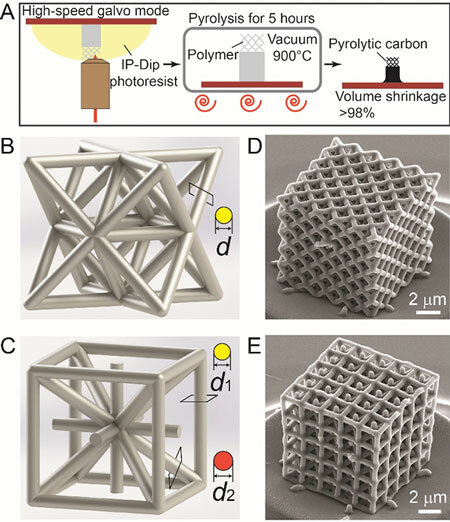 In a recent paper in PNAS ("Lightweight, flaw-tolerant, and ultrastrong nanoarchitected carbon"), Prof. Li’s group collaborated with the groups of Prof. Gao andP Prof. Greer, and demonstrated the creation of pyrolytic carbon nanolattices with stretching-dominated octet- and iso-truss topologies by a two-step procedure: direct laser writing and pyrolysis at high temperature (see Fig. 1). The unit cells of these nanolattices had the same dimensions of approximately 2 m, and the diameters of the individual struts in the lattices varied from 261 nm to 679 nm. The smallest characteristic size of the struts approached the limits of resolution of the available three-dimensional lithograph technologies. In situ scanning electron microscopy and ex situ compressive testing revealed that these pyrolytic carbon nanolattices have a compressive strength of up to 1.90 GPa at a density below 1.0 g/cm3 (see Fig. 2A). As a result, the pyrolytic carbon nanolattices achieved an exceptional specific strength (i.e., ratio of strength to density) of 1.90 GPa g-1 cm3, which is 1-3 orders of magnitude higher than those of nearly all micro/nanolattices reported so far. Such specific strength of our nanolattice is about 35% of that (5.60 GPa g-1 cm3) of diamond, which has the highest specific strength of all bulk materials. The compression experiments also showed that these octet- and iso-truss nanolattices have the average fracture strains of 14.0% and 16.7%, respectively, which are larger than those of various brittle nanolattices reported previously. More remarkably, these nanolattices become insensitive to fabrication-induced defects (see Fig. 2B), allowing them to attain nearly theoretical strength of the constituent material. The combination of ultra-low density, ultra-high strength and specific strength, large fracture strain and flaw insensitivity of these pyrolytic carbon nanolattices are attributed to the miniaturization (nanosized beams) of the overall structure and the optimization of the lattice topology. This study provides a feasible pathway for scalable fabrication of robust nanoarchitected with defect tolerance, ultralight weight, and superior strength.